Who Are the Megachurch Leaders Who Decide Elevation Church Pastor Steven Furtick's 'Secret' Salary and Influence His Ministry? North Carolina media have done several reports on the $1.7 million home being built by Elevation Church founder and Lead Pastor Steven Furtick and his wife, revealing among other things, that a group of overseers responsible for deciding the Charlotte minister's salary is made up of other well-known megachurch leaders. Pastor Furtick reportedly has refused to disclose his salary to the Elevation Church congregation, as well as the general public, although the megachurch discloses in its 2012 financial report (read it here) how much it received in "average weekly operating offerings" ($391,299) as well as how much was given in the church's seven-year lifetime of ministry in local and international outreach ($2.5 million). "The Board of Overseers sets Pastor Steven's salary. Very similar to most large non-profit organizations, there is an independent compensation committee formed by the Board of Overseers that recommends a salary which the Board votes to approve. The compensation committee uses a salary study performed by an independent CPA [Certified Public Accounting] firm to get a basic salary range. This study is also performed for additional executive staff." The Board of Overseers members were personally recruited by Pastor Furtick, according WCNC-TV. The local television news station also reports that Elevation Church does not have elders or deacons, something which the Southern Baptist Convention to which the North Carolina church belongs leaves to the discretion of its members. While Elevation Church's 2012 annual report lists Jerry Sumner and Gary Sessions as its finance director and controller, respectively, WCNC-TV reports that Executive Pastor James "Chunks" Corbett is intimately involved in the megachurch's business dealings. "There is one man living in the Charlotte area who runs Elevation: Chunks Corbett. If you want to understand Elevation you have to understand his role," reports WCNC-TV. "As executive pastor, Corbett is at the center of Furtick's organization. In 2005 he incorporated Elevation Church. In 2007, he incorporated Corban Properties Southeast — a for-profit company. In 2008, he signed on as trustee for the Jumper Drive Trust that owns the Furtick's home. And in 2009, he incorporated Sun Stand Still Ministries — another non-profit. All four list the same principal address: 11416 East Independence, Suite N, the location of the Matthews church." The news station added, "Corbett declined to speak on camera to NBC Charlotte, but spent 90 minutes with me (the reporter). He praises Furtick for his generosity with the church, but he refuses to release the church's audited financial statement or its bylaws." The Matthews, N.C., church is one of the seven Elevation Church locations in the Charlotte Metro area. There is also "one location in the Greater Toronto Area, as well as homes and university extension sites all over North America," according to the megachurch's website. Another notable influence on Pastor Furtick's ministry is Grapevine, Texas, Pastor Ed Young of Fellowship Church, and his annual C3 Conference. "No conference has had a greater impact on my life and the life of our church than C3," Furtick says in a video published online. "It was at C3 before we started our church, that I sat in the back of the room and saw for the first time what the local church was capable of. It was through Ed and Lisa Young's leadership that I saw the creative potential of the church." In addition to reporting that Pastor Young has served on Elevation Church's Board of Overseers, WCNC-TV suggests that Pastor Furtick might also be modeling Pastor Young in other ways, noting: "Young bought a 10,000 square foot home. Furtick bought a 16,000 square foot home. Young's home is worth $1.5 million. Furtick's home cost $1.7 million. Young put his home in the name of Palometa Revocable Trust. Furtick put his home in the name of the Jumper Drive Revocable Trust." Pastor Furtick, who has called his pastor and good friend Craig Groeschel of LifeChurch.tv "the greatest pastor in America or the world," spoke out from the pulpit on more than one occasion regarding the investigative reports on his $1.7 million home and his financial accountability. "My wife and I made a decision, and we built a house. It's a big house, and it's a beautiful house, and we thank God for it ... We understand everything we have comes from God." The 33-year-old pastor was open about the house, which he described as 8,400 square feet of heated living area and the rest comprising of basement, attic, garage and porch space. 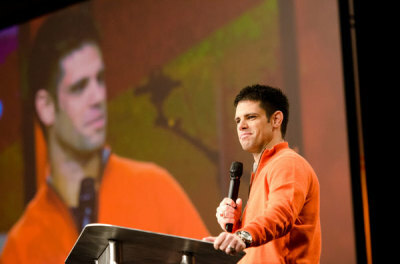 Furtick told the congregation he was most worried about how the media attention affected them. "I'm sorry for the uncomfortable conversations you had to have this week… I have always tried to make this a church where you could be proud of your church," he said, after which members gave him a standing ovation. The pastor told the members he was grateful for "what you've prayed, what you've said and what you haven't said… We appreciate knowing that you have our back." He also said the media should not be seen as an enemy. "I do not call this an attack," he said. "This is a news story, and the media is not our enemy." Furtick emphasized that he believes in a "ministry of integrity." "That has not changed, and that will not change," he said. According to Elevation's chief financial officer, Chunks Corbett, the pastor is paying for the house with income from the books he's written and will write. Elevation Church, named one of the fastest growing churches in America by Outreach Magazine, was founded by Furtick in 2006 and welcomes almost 15,000 worshippers every week. Tonia Bendickson, Elevation Church's director of outreach and media relations, told The Christian Post Wednesday that there was presently no plan to release an official statement regarding the investigative reports or questions surrounding Pastor Furtick's financial accountability. Dino Rizzo - former lead pastor of Healing Place Church in Baton Rouge, La. After resigning from the Healing Place Church in 2012 due to an admitted inappropriate relationship with a female friend, Rizzo is on staff as a "speaker" at Church of the Highlands in Birmingham, Ala., on a "supervised" basis under the direction of Founding Pastor Chris Hodges. Stovall Weems - lead pastor of Celebration Church in Jacksonville, Fla.
Pastor Weems, along with at least two other members of Elevation Church's Board of Overseers, has participated in the Charlotte megachurch's Code Orange Revival. As WCNC-TV reports, these men are paid to preach at Elevation Church conferences, and they pay Furtick when he preaches at their conferences or megachurches. Perry Noble - senior pastor at NewSpring Church in Anderson, S.C.
Pastor Noble, who also has spoken at Elevation Church's Code Orange Revival, was reported by The Christian Post last year as coming to Pastor Furtick's defense amid suggestions that the Charlotte pastor does not preach Biblically-sound doctrine. Kevin Gerald - lead pastor of Champions Centre in Tacoma, Wash.
Pastor Gerald, who also preached at Pastor Furtick's Code Orange Revival, has published several books, including Developing Confidence, Pardon Me, I'm Prospering, The Proving Ground, Raising Champion Children, Forces That Form Your Future, Mind Monsters and By Design or Default. Dr. Graham, a former president of the Southern Baptist Convention, joined Pastor Furtick, and a handful of other Christian leaders, at Elephant Room 2 in 2012. Dr. Graham also recommended Pastor Furtick's 2012 book, Greater: Dream Bigger. Start Smaller. Ignite God's Vision for Your Life., writing, "Steven Furtick understands spiritual vision like few people I know. If you desire a life beyond your imagination, read this book! Greater will take you to a whole new level and invite you to experience the power of God every day."